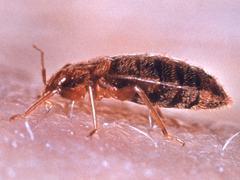 The common bedbug (Cimex lectularius) is the species best adapted to human environments, feeding on human blood. Hide in headboard and bed structure, mattress, broken plaster, crevices in woodwork, skirting boards, and carpets, pictures and wall sockets. Appearance: adult strongly depressed, oval body, reddish brown, length females 4-8mm; males slightly smaller. They peak in numbers in the autumn as in cold weather egg laying ceases and nymph development slows. Bedbugs are nocturnal and therefore are active when people are asleep. Once they have found a human host, they inject saliva to cause irritation and swelling. They can then feed for up to 10 minutes and then hide where they will mate and lay eggs. The bedbug has a maximum life span of 1 to 1.5 years.